This is a book about the failure of democracy. That is inflammatory language, and I adopt it advisedly. One of John's projects was to show how the best guess we can make, from past experience, is that the world will tire of democracy sometime in the twenty-first century and collapse into a universal state. This is an idea with roots at least back to Aristotle, but the best known exponents in the English speaking world are Oswald Spengler and Arnold Toynbee. This work takes a rather different tack, the revival of the Whig interpretation of history. Whig history and historical cycles aren't usually things that go together, so this idea needs a little explication. The usually gloss on the Whig interpretation of history is that we find ourselves in a more or less inevitable progression towards a final state, usually not an eschaton as such, but rather something more prosaic like constitutional democracy. It isn't hard to find critics of Whig history, so I won't get into that here. 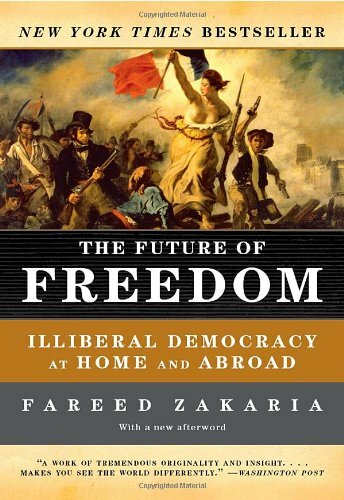 What makes this book interesting is the things Zakaria cites as undermining democracy at home and abroad. We now have twelve years more history to evaluate under Zakaria's model and see what happened. Russia still lacks any kind of independent civil society. The Russian Orthodox Church has tended to hew closely to the state. As predicted, a lack of independent sources of power leaves you with no option other than a good czar. Putin is still in charge. Attempts to instill democracy in a variety of Arab countries have failed miserably, leading to wars and a refugee crisis. Most of these states were organized on religious lines, ethnic lines, or both. Democracy has enabled clear majorities to oppress minorities, or else civil war has ensued when no one had a clear balance of power. It now seems clear that the lack of democracy in these places was a feature, not a bug. On a side note, the popularity of groups like the Muslim Brotherhood is no doubt enhanced because they *are* civil society in countries like Egypt. The Brotherhood provides many services to the people. America and Europe are roiled by populist movements. These gain followers precisely because of the perception that the elites that rule Western Civilization seem uninterested in anything other than their own aggrandizement. Zakaria wanted to highlight these democratic deficiencies in order to save liberal democracy from itself. So far, it looks like this has not been effective. In fact, my suspicion is that his proffered remedies, for example more elite unaccountable agencies run by experts like the Federal Reserve, will hasten rather than retard progress towards a universal state. As such, I'm surprised by the cool tone of John's review, but maybe he was focusing on what Zakaria wanted, rather than what he is getting. People long assumed that liberal democracy was a transitional political order. Socialists believed that it was just a stop or two away from the Finland Station. Reactionaries thought likewise: they fully expected that the tawdry age of capitalism and electoral politics would inevitably give way to communism and honest tyranny. In both cases, the assumption was that the modern age was on a trajectory that would carry history past the capitalist republic to an era of perfect equality and transparency. “The Future of Freedom” is chiefly concerned to highlight the dangers to liberty that electoral democracy can pose in developing societies that do not have the cultural and social infrastructure to support it. More controversially, Zakaria argues that “democracy,” or at least populism, is degrading the performance of key institutions in developed countries. He argues that it is even undermining the legitimacy of government itself. The author freely admits that he is reviving the Whig interpretation of history. In this view, there were certain features of Western civilization, and particularly of its British variant, that predisposed it toward the development of ordered liberty. The West has been favored by an accident of geography: Europe is so broken up by mountains and rivers that no overwhelming imperial government could form to drown all local autonomy. More important, there was the fact that, when the Emperor Constantine moved the principal capital of the Roman Empire to Constantinople, he did not take the pope with him. This meant that church and state would develop separately in later European history. Even if the medieval church was not much interested in the liberties of individuals, its claim to rights not created by the state provided a template for later claims to civil liberties. When capitalism appeared and dissolved the old feudal social structures, it also created a middle class with the education and financial independence to make those claims successfully. The history (and geopolitics) in this book needs work, frankly, both with regard to interpretation and mere facts. For instance: no, Caligula did not make his horse a senator. And whenever else the Second Great Awakening started, it did not start in 1780. The political theory is quite another matter: it comes straight out of "The Federalist Papers." The key formula is James Madison's, who said that a government conducive to liberty must be able to do two things. First, government must be able to govern the governed. Second, it must be able to govern itself. There are many states in the world that cannot do either, and holding elections in those places only makes things worse. Zakaria is keen to compare the successful transition to liberal democracy made by East Asian states, such as Taiwan and South Korea, with the stagnation in despotism typical of the Middle East. (“Liberal” in this book consistently means “friendly to personal liberty and to the free market,” not “moderate Left.”) From 1945 into the 1980s, East Asia was an argument for the “cultural theory” of despotism. Confucianism was essentially authoritarian, it was thought, so it was only natural that the Confucian legacy would be political systems that are permanently paternalistic and heavy-handed. In reality, what was happening in those years was that the future “Asian Tigers” were developing the “stuffing” of liberty. The stuffing is largely institutional. It includes an effective educational system, physical infrastructure, a reasonably honest bureaucracy, and a legal system that respects property rights. Interest groups, from professional associations to religious groups, must be given some space to function, even if they are tightly controlled at first. The same is true of the press. There must be an economy successful enough to create a substantial middle class. As we will see, it is also necessary that the wealth, for the most part, be produced locally. When all these features come into play, as they did in East Asia by the 1970s, even governments with no interest in democracy find that they must consult and encourage elements of civil society that are very interested in democracy indeed. By that point, there will be an electorate responsible enough to trust with the franchise. How rich must a country be before it can maintain a democratic system? Zakaria says experience shows that democracy in any country with a per capita income below $3000 per year is in grave danger. Hold a free election in a desperately poor country, he says, and the result is likely to be “one man, one vote, one time.” When income gets up to about $6000, however, a new democratic system is a good bet. Comfortably middle class democracies are almost indestructible. Money, however, is far from everything. Several Middle Eastern countries have average incomes well about the magic $6000 level, but are still far from being liberal democracies. The problem with the oil states is that they lack the stuffing of liberty. Wealth is not created by society, so the government need not bargain with the governed for the means to support itself. Rather, the government distributes a portion of the oil wealth in order to pacify the people. The rest tends to be stolen. Not all the despotisms of the Middle East are oil states. Not all of them are even especially poor. Other reasons for the failure to advance to democracy can include a political system that is organized in terms of religion or ethnicity. These criteria do not lend themselves to compromise, so there is little chance for the state to reach out to expand its base of support. Zakaria notes, correctly, that Islam should actually be more friendly to democracy than Christianity is. Certainly it is more egalitarian, both in theory and in fact. However, I think Zakaria is quite wrong when he says that there is no fundamental church-state problem in Islam. He says there is no such problem because Islam started where the European Reformation ended, with the state predominant. That is questionable history, but even if it were true, there is still the fact that the Koran was written with an eye to government, whereas the Bible was not. There have been many instances of state and even imperial Christianity, of course, but the possibility of a complete divorce from politics has always been a resource of Christianity that Islam lacks. “The Future of Freedom” dwells on what happens when a country without the necessary economic or institutional infrastructure holds elections. Russia is wealthy enough to support liberal democracy, but presidents Yeltsin and Putin have exerted themselves to eliminate every organized force that might oppose them. The result is a political system without strong independent interest groups, or even important independent institutions. When such a situation arises, the elected executive is the only effective and legitimate figure. He does not preside over a government, but a court. Similar systems have long retarded the development of Latin America. As one member of the Russian Duma lamented, the country has regressed to the point where all they can do is hope for a good czar. Fareed Zakaria comes from India, and he has some disconcerting things to say about that country. India is a freewheeling democracy, he acknowledges, one whose per capita income is well below the point where he says democracy would be secure. While he does not suggest that Indian democracy is likely to come to an end anytime soon, he does suggest that it is going rancid, particularly at the state level. Quite aside from stealing elections, parties in power have little regard for judicial independence or fiscal responsibility. State governments become bloated patronage machines with no purpose but to keep the incumbents in power. Government at all levels has been envenomed in recent years by Hindu nationalism (and Islamicism, where the population is Muslim), with demagogues stirring up murderous mobs that the authorities make no effort to control. The author emphasizes that India has done as well as it has because it started with liberal constitutionalism, imposed by the British and indigenized by India's substantial educated elites. Democracy came later, and in stages. After independence, democracy was almost a prerogative of the Congress Party, which was run by secular intellectuals who had a high sense of public duty. The decline in the quality of Indian democracy has come about because it has become more democratic. Much the same is true of democracy in the United States, if the author is to be believed. He reminds us that America's liberal democracy had much the same origins as India's: the founders were local elites, with long experience in responsible self-government, who had been schooled in British ideas of ordered liberty. Democracy played a part in the system even during colonial times in America, but it was democracy with a restricted franchise. The right to vote was explicitly linked to the duty to pay taxes; the franchise was a form of oversight of those to whom power had been delegated. The incarnation of this political culture was the federal Constitution. As Zakaria never ceases to remind us, the Constitution of the United States established a republic, not a democracy. The document is thick with anti-democratic features: life-appointments to the federal judiciary; seats in the Senate for even the most thinly peopled state; the electoral college. Some of these devices are better than others, the author acknowledges, but we would be wrong to oppose them simply because they reduce the influence of popular opinion on government. Liberal democracy requires restraints on pure democracy. Otherwise, government will become incoherent, ineffective, and contemptible. As the franchise expanded, American politics became more rowdy and populist, but the basic political culture survived. So did the traditional elites, chiefly White Anglo-Saxon Protestants with roots in the Northeast. In Zakaria's telling, these WASPs maintained control over key institutions well into the 20th century. What they did not control themselves they controlled by example. The notions of good government and disinterested public service remained viable ideals throughout the United States, even if they were often honored in the breach. The problems began when people tried to achieve these things through more democracy. On the state level, Zakaria's example of democracy run amok is the government of California. Into the 1960s, California decided how to use public resources chiefly through votes of the legislature, on policies negotiated by the political parties, and approved or rejected by the governor. The practice of government was often high-handed, but the result was arguably the world's best systems of roads and public education. Then, largely in response to indifference among the political class to arbitrarily high taxes, the practice of direct democracy through public referenda took hold. Soon, not just taxes but education and language policy were being set by referenda. Sometimes these measures were needed to unclog a blocked political system, but the referendum questions are often badly drafted. They sometimes contradict earlier referenda, or even questions presented at the same time. According to Zakaria, the California legislature now has control over only 15% of the state budget; the rest is on automatic pilot, mandated by referenda or other hard-to-change provisions of law. Since taxes can be changed only with legislative supermajorities or referendum votes, rational tax policy is impossible. Meanwhile, the party system has less and less effect on important issues. Referenda are introduced and promoted by ad hoc groups, often supported by eccentric rich people. Thanks to the practice of selecting candidates through party primary-elections, which have notoriously low voter turnout, the parties themselves are increasingly dominated by radical activists. These people are just as eccentric as the referendum billionaires, but less lovable. When people trouble to vote in general elections, they more and more vote as independents. Zakaria multiplies instances of creeping democracy, some of which are more plausible than others. There is a long and not very persuasive discussion of the growth of megachurches, which the author says illustrates a general trend away from orthodoxy and toward doctrinal consumerism. He says that gallery owners are shying away from new art in favor of shows dedicated to commercial products people might want to see. This may be true, but is not obviously to be deplored. His most intriguing remarks deal with the downside of popular capitalism. He says it's a good thing that most people now own securities in one form or another. It is also good that people have easy access to credit. The problem is that the great old financial institutions are now either gone, or are run by people with no sense of public responsibility. The robber barons and financiers of 1900 had many faults, but they were to some degree statesmen. They had to maintain the confidence of the other heads of great institutions. Now CEOs have no thought but to please a rabble of stockholders and consumers. Certainly they have no sense of themselves as members of a responsible elite. What all these examples have in common is that the attempts to make traditional institutions more democratic have had the effect of making them more contemptible. The Watergate reforms in Congress seem to have rendered that body permanently less popular and trusted. Greater participation of people in the world of finance has occurred at the same time that people's trust in corporations has declined. The institutions in which people express the most trust are the ones least likely to solicit their opinions. People trust the Federal Reserve. They trust the military. They trust the Supreme Court, which is a bad sign, if you ask me. In any case, Zakaria suggests that we should take a lesson here. He says that people are ready for a return to “mediation.” They want people with expertise and character to make choices for them. He cites the revival of the Book of the Month Club, which has returned to its original mission of selecting books on the basis of quality, rather than merely marketing books with an eye to what will sell best. Amazingly, he says that the Internet publications called “blogs” (for “weblogs”) represent just the opposite of the expectation that the Internet would make everyman a publisher. Blogs actually winnow out the content of the Web and direct their readers to the best. Blogs are thus a sign of returning elitism. So he says. The recommendations in “The Future of Freedom” for taming democracy internationally would break sharply from current practice. Although Zakaria always envisions liberal democracy as the goal of national development, he is clear that it must never be imposed by fiat, or too soon. Tyranny and brutality must be opposed, but we must recognize that the best government for some countries at the moment may be that of a “liberal autocrat.” The international community should discourage human rights violations, and promote the creation of the stuffing of liberty in societies with closed political systems. When a country is ready, the government should be pressured to go to an electoral system. Such democracies would be more viable. Thus, the world will fill up with liberal republics. As for the developed world, Zakaria says that we should get over the fear of delegating authority. The more public bodies there are like the Federal Reserve, he suggests, the better we all will be. He makes the intriguing suggestion that Congress should delegate its tax-writing function to some independent body. Congress would vote on taxes every year, as the Constitution requires, but only on the whole package. This would eliminate pork-barrel spending and diseconomic tax breaks. Actually, it would eliminate federal politics as we know it. On the international level, Zakaria likes the institutions of the European Union precisely because they are removed from the influence of pollsters and demagogues. There are certain things that the international community has to promote (the movement of immigrants is one of them), and the institutions that oversee them have to be insulated from public pressure. We also need elites fit to man the institutions of in-camera virtue. We do have elites, he points out, in the sense that we have small groups of experts who are the only ones capable of performing certain vital public functions. What we lack are people who think of themselves as members of elites, for the excellent reason that they have not been taught to do so. The elite educational institutions used to do this rather well, he points out. Is there any good reason why they could not do it again, to put less emphasis on career and more on public service? Readers familiar with Patrick Kennon's The Twilight of Democracy will see that Zakaria has made much the same arguments, though he does not cite Kennon. There is something to be said for the points they make, though many of us may not find the future they imply any more attractive than the old future of universal communism. Finally, I must make this caveat. It is a fine thing to be a member of an elite that exists without thinking about itself, that is elite simply because of the excellent work it does. When you have to think about creating an elite, however, that means you are not a member.